Written by: Jiří VašekEven stodgy state institutions – the parliament, the government, the Castle, municipal offices, etc. – have their own web sites. If you need to deal with the government, the internet should be your first consultant before setting out on travails through the offices. This site operated by European Business Enterprise literally overwhelms you with links to probably every state institution. You can search under individual districts or clearly comprehensible titles like Law and Legislation, Labor and Social Affairs, Trade-Industry, Finance, Informatics, or directly under the addresses of individual offices. Another table maps out firms with close ties to state administration, beginning with advocacy and legal services through expert opinions. Although the directory is freely available online, access to certain addresses is limited, provided only once the relevant fee has been paid. Upon opening these substandard pages, you may appreciate the link entitled Ministries. 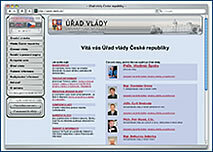 On their sites you will find substantially more updated, useful information than in the virtual Straka Academy (the parliament’s seat). Interesting and little-known information is offered by the EU item, which covers all of the laws connected with the union, including links to other Czech and foreign institutions mapping out the issue of integration. You can look around in the EU library, read the weekly issued by the European parliament, or study what awaits us with respect to taxes on transport of goods to and from the Eurozone. This site contains just enough information to ensure that you won’t get lost. The most important data is under “Frequently asked questions”. After learning that the senate is supposed to debate and approve laws passed by the lower house, you can follow the link called “How I voted”, and see the personal pages of all 81 senators. Go to “All meetings + search” and learn that for presentations and participation in voting some representatives rate nearly zero! Divided into two parts, this site maps out the rights and authority of the head of state, including those of close family members (the first lady), as well as the functions of the Office of the President of the Republic. You can find out which laws the president has already approved and which he has returned to the parliament for reworking. The second part of the site focuses on Prague Castle itself – the histories of the structures, planned exhibitions and ticket prices. Just enter a subject into the search window and in seconds you will have the latest information at your disposal, such as how the tender for shop rentals on Golden Lane is going. 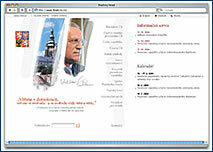 The chamber of deputies site has English, French, and German versions as well as Czech. It is so simply elaborated that you can reach individual representatives just by entering their initials. Each has his or her own presentation, with hyperlinks relating to other activities, including places where you can meet with them. You can read what the senate’s weekly agenda looks like, and you can follow their meetings live by using the RealAudio program. 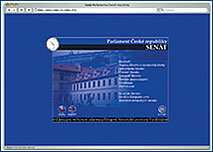 You can even take a virtual tour of the historical parliament building on the www.psp.cz/docs/guide page. The latest exchange rates of global currencies as determined by the Czech National Bank, along with a currency converter. 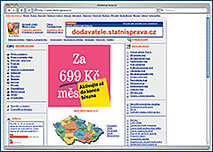 Other useful information includes a directory of other banks and exchange centers, along with their respective exchange rates. This site is useful for everyone buying apartments or thinking about building homes. You can look at the Registry of Deeds and, free of charge, find out who owns a building or piece of land, and whether the real estate is the subject of distraint. GE Capital Leasing offers the opportunity to buy, online, a used car on an installment plan. Here people can find both the cars themselves as well as the size of the downpayments and installments. Also check www.cars.cz or www.auto.atlas.cz. Find out how to proceed against state authorities or state administration at odds with legislation or ethics, thus harming you as a citizen. The site contains Law No. 349/1999 Coll., on the Public Guardian of Rights (Ombudsman), and advice on submitting motions. – RIP stands for Raster Image Processor. No longer used only by professionals in the media, the term is now popular among people who record their vacations on digital cameras. While an advantage of this recording is high quality, its disadvantages include the vast volume of stored data. If you were to download them from a camera to a computer’s hard drive, there wouldn’t be room for anything else. So this is where so-called “ripping” programs come into play, which mercilessly remove the least substantial information from the film, leaving only an expurgated torso. You can then record it all on one or two standard CDs.